Do not imagine that mathematics is hard and crabbed, and repulsive to common sense. It is merely the etherealization of common sense. 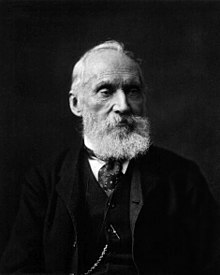 William Thomson (June 26, 1824–December 17, 1907), 1st Baron Kelvin, often referred to simply as Lord Kelvin, was an Irish mathematical physicist. To live among friends is the primary essential of happiness. I often say that when you can measure what you are speaking about, and express it in numbers, you know something about it; but when you cannot measure it, when you cannot express it in numbers, your knowledge is of a meagre and unsatisfactory kind; it may be the beginning of knowledge, but you have scarcely, in your thoughts, advanced to the stage of science, whatever the matter may be. There cannot be a greater mistake than that of looking superciliously upon the practical applications of science. The life and soul of science is its practical application; and just as the great advances in mathematics have been made through the desire of discovering the solution of problems which were of a highly practical kind in mathematical science, so in physical science many of the greatest advances that have been made from the beginning of the world to the present time have been made in earnest desire to turn the knowledge of the properties of matter to some purpose useful to mankind. Quaternions came from Hamilton after his really good work had been done, and though beautifully ingenious, have been an unmixed evil to those who have touched them in any way. As a response to Major B. F. S. Baden Powell's request to join the Aeronautical Society, December 8, 1896. Symmetrical equations are good in their place, but 'vector' is a useless survival, or offshoot from quaternions, and has never been of the slightest use to any creature. Mathematics is the only true metaphysics. It is conceivable that animal life might have the attribute of using the heat of surrounding matter, at its natural temperature, as a source of energy for mechanical effect . . . .The influence of animal or vegetable life on matter is infinitely beyond the range of any scientific enquiry hitherto entered on. Its power of directing the motions of moving particles, in the demonstrated daily miracle of our human free-will, and in the growth of generation after generation of plants from a single seed, are infinitely different from any possible result of the fortuitous concurrence of atoms. Tesla has contributed more to electrical science than any man up to his time. 1. There is at present in the material world a universal tendency to the dissipation of mechanical energy. 2. Any restoration of mechanical energy, without more than an equivalent of dissipation, is impossible in inanimate material processes, and is probably never effected by means of organized matter, either endowed with vegetable life or subjected to the will of an animated creature. 3. Within a finite period of time past, the earth must have been, and within a finite period of time to come the earth must again be, unfit for the habitation of man as at present constituted, unless operations have been, or are to be performed, which are impossible under the laws to which the known operations going on at present in the material world are subject. If the water flow down by a gradual natural channel, its potential energy is gradually converted into heat by fluid friction, according to an admirable discovery made by Mr Joule of Manchester above twelve years ago, which has led to the greatest reform that physical science has experienced since the days of Newton. From that discovery, it may be concluded with certainty that heat is not matter, but some kind of motion among the particles of matter; a conclusion established, it is true, by Sir Humphrey Davy and Count Rumford at the end of last century, but ignored by even the highest scientific men during a period of more than forty years. The beauty and clearness of the dynamical theory, which asserts heat and light to be modes of motion, is at present obscured by two clouds. I. The first came into existence with the undulatory theory of light, and was dealt with by Fresnel and Dr. Thomas Young; it involved the question, how could the earth move through an elastic solid, such as essentially is the luminiferous ether? II. The second is the Maxwell–Boltzmann doctrine regarding the partition of energy. From a 1900, April 27, Royal Institution lecture. “Lord Kelvin, Nineteenth Century Clouds over the Dynamical Theory of Heat and Light”, reproduced in Notices of the Proceedings at the Meetings of the Members of the Royal Institution of Great Britain with Abstracts of the Discourses, Volume 16, p. 363–397 and Philosophical Magazine, Sixth Series, 2, 1–40 (1901). Misattributed to Kelvin since the 1980s, either without citation or stating that it was made in an address to the British Association for the Advancement of Science in 1900. There is no evidence that Kelvin said this, and the quote is instead a paraphrase of Albert A. Michelson, who in 1894 stated: "… it seems probable that most of the grand underlying principles have been firmly established … An eminent physicist remarked that the future truths of physical science are to be looked for in the sixth place of decimals." The attribution to Kelvin giving an address in 1900 is presumably a confusion with his “Two clouds” speech, delivered to the Royal Society in 1900 (see above), and which on the contrary pointed out areas that would subsequently see revolutions. 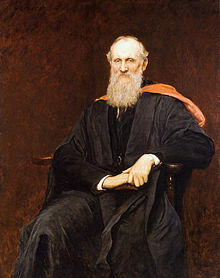 The man of true Physical instincts, endowed with the great faculty of scientific imagination, possessed for example by Lord Kelvin in a very remarkable degree, is for ever imagining models which shall enable him by their working to represent and depict the course of actual physical processes. The possibility and consistency of such models require Mathematical Analysis for their investigation. E. W. Hobson, Mathematics, from the points of view of the Mathematician and of the Physicist (1912) p. 7. According to Sir W. Thomson's theory of Vortex Atoms, the substance of which the molecule consists is a uniformly dense plenum, the properties of which are those of a perfect fluid, the molecule itself being nothing but a certain motion impressed on a portion of this fluid, and this motion is shewn, by a theorem due to Helmholtz, to be as indestructible as we believe a portion of matter to be.